Buy your season ski pass 50% cheaper before the 10th of December! 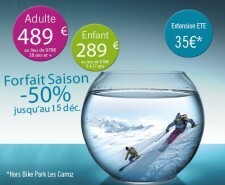 5 resorts linked together, Flaine, Les Carroz, Morillon, Samoëns and Sixt. Snow guaranteed to make the most of your stay. *Available until 15/12/2018, online only ! The insurance Forfait+ is a personal insurance valid in every ski resort in France. Is it your first purchase online? Fill on the required information... And that's it! Your pass will be sent to your home free of charge. You have a SkiCard with an Internet n°? You simply have to download it online. Be done with unnecessary information to give, you'll only be asked to send an updated ID photo. Your SkiCard will be automatically recharged online. The transaction and payment 100% secured. Login with your ID information (Login and password you created for your first purchase). If you have forgotten them, they'll be sent to your email address. With the Internet/WTP N° that is on the back of your SkiCard, you can recharge your card very easily on grand-massif.com! Be careful, during your online purchase, an updated photo will be asked (for first purchases and recharging).